Engraving showing the burning of three witches at Derneburg, Germany, in 1555. Courtesy Fortean Picture Library. Name given to the mid-fifteenth through the mid-eighteenth centuries, when witchcraft persecution was at its height. 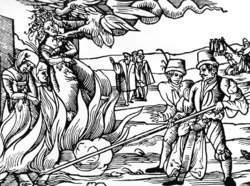 The supreme penalty for witchcraft at that time in many countries was burning at the stake, although this was not so in England or colonial America, where hanging was the penalty. first make the witches a diabolic sect and give rise to the notion of the witch-sabbath." Witchcraft generally fell under the heading of heresy, and it was heretics who were burned. This stemmed from St. Augustine's (354-430) theology expressed in Liber de Fide ad Petrum Diaconum in which he said that he "most firmly holds and in no way doubts that not only every pagan, but every Jew, heretic, and schismatic, will go to the eternal fire, which is prepared for the Devil and his angels." This position was incorporated into Liber extra, the decretals of Pope Gregory IX in 1234. The position was later developed and expanded upon by such inquisitors as Nickolas Eymeric and Thomas Aquinas. The practice of burning was recognized by both the ecclesiastical and secular courts. In Spain and Italy all were burned alive, but elsewhere, the guilty might be strangled just before being burned if they showed contrition and begged forgiveness. The persecutions were started by the Catholic Church but the Protestants soon took up the cause as well. Jean Bodin, in De la Demononamie des Sorciers (Paris, 1580), stated, "Even if the witch has never killed or done evil to man, or beasts, or fruit, and even if he has always cured bewitched people, or driven away tempests, it is because he has renounced God and treated with Satan that he deserves to be burned alive. . . . Whatever punishment one can order against witches by roasting and cooking them over a slow fire is not really very much, and not as bad as the torment which Satan has made for them in this world." Adding insult to injury, the expense of burning a witch was charged to his or her estate. Similarly, when an accused witch was put in jail, all expenses were charged to him or her. Many people remained in jail long after being acquitted, simply because they could not pay their jail bill. Many of the charges of witchcraft leveled against people across Europe were politically motivated. Not all of those charged were poor (Dame Alice Kyteler, for example), and it was the Church, the State, or the feudal overlord who benefited from the confiscation of the accused's property. Often, then, the temptation of gaining wealth and property was behind a charge of witchcraft. Joost Damhouder, a recognized authority on criminal law in the sixteenth century, wrote (Enchiridion, 1554) that "Whoever kills by sorcery, or by charms, should be burned in the conflagration of fire, for that is not simple homicide, because sorcery degrades homicide so that it merits death by burning. In the same way, he who hinders by magic the natural power of generation in men or women, or brings it about that a woman is not able to conceive, or to give birth to the child in her womb, or who dries up the milk of a wet nurse, or by whatever means of sorcery or maleficia kills anyone. . . is to be considered a murderer." 900. There are examples of hundreds of people being burned throughout the persecutions. Some estimates put the total number as 500,000, while others put it as high as nine million. As Rosemary Guiley points out, today modern Wiccans speak of a possibility of a return to "the burning times," meaning a reawakening of the religious persecutions of the past. Fans will get a chance to hear Christy play some of the tracks from his emotive Burning Times album. The characteristic swelling during the devolatilization stage decreased, resulting in somewhat longer burning times. She exposes the flagrant abuses of "empirical" history by modern witches who have fabricated a primeval pagan lineage, and by radical feminist scholars like Mary Daly who have subscribed to "the myth of the Burning Times," which interprets witchcraft trials as part of a broader pattern of male violence against women. This enhanced speed cuts down burning times significantly. Thankfully, Christy Moore has avoided this unwanted pitfall with the release of Burning Times. Through reduced ignition and fuel burning times, PurEscape(TM) Performance Optimizer is designed to improve the utilization of energy released during combustion, resulting in higher average peak pressures and improved quality of the average combustion cycle. Christy, who is one of the most success Irish artists of all times, will wow the crowds with renditions from his new album, Burning Times, which will be released next month.